Tender filet mignon, lovingly wrapped in bacon and seared to perfection, then served over creamy, cheese grits. 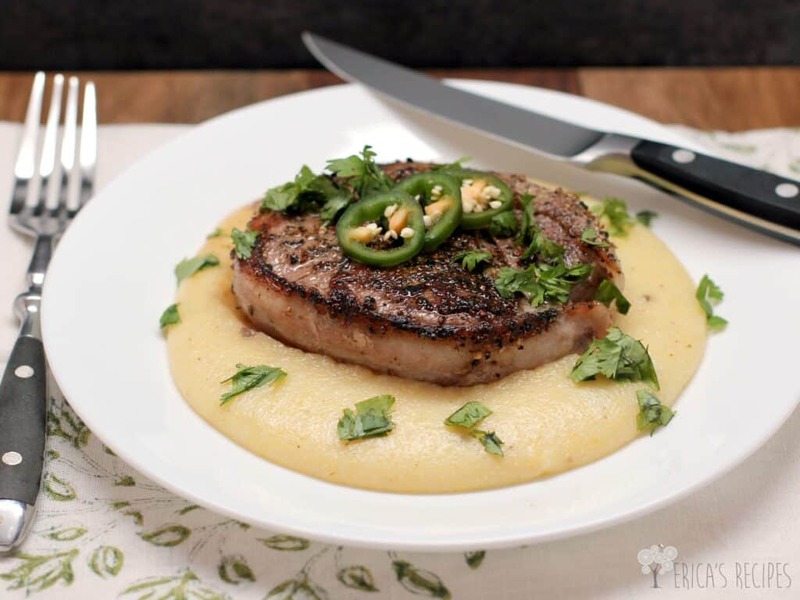 This Bacon-Wrapped Peppercorn Filet with Pepperjack Grits recipe is extraordinary. Filet mignon. Tender, delicate filet mignon. Thanks to my father-in-law, I just happened to have a couple of these beautiful bits of beef in my possession …so I wrapped them in bacon, cooked them real nice, and served them on some creamy, cheesy, kicked-up grits. Heaven. Sheer heaven. If you spend the money on such a cut of meat like filet, the last thing you want to end up with is a hockey puck. So, to cook filet mignon steaks, I give them a little extra care by starting on the stove-top and finishing the oven. This way, using full-contact with a screaming hot cast iron skillet, I can get that really good sear faster than on a grill to keep the center nicely rare. Now the grits… Love them? Hate them? If you make them with plenty of salt and make them cheesy, like with my Shrimp and Grits or this recipe here, grits can be amazing. These grits are amazing. Even the leftovers were fabulous with some simple sauteed shrimp for lunch the next day. Yum yum yum. Yum. So for a gorgeous meal, elevated way past meat and potatoes – for a special occasion or just if you want to show someone you love them, here’s a recipe I sincerely hope you’ll want to keep. Very lightly rib the steaks all over with olive oil. Season both sides with salt. Put the crushed peppercorns in a dish, and gently press the steaks into the peppercorns to coat both sides. 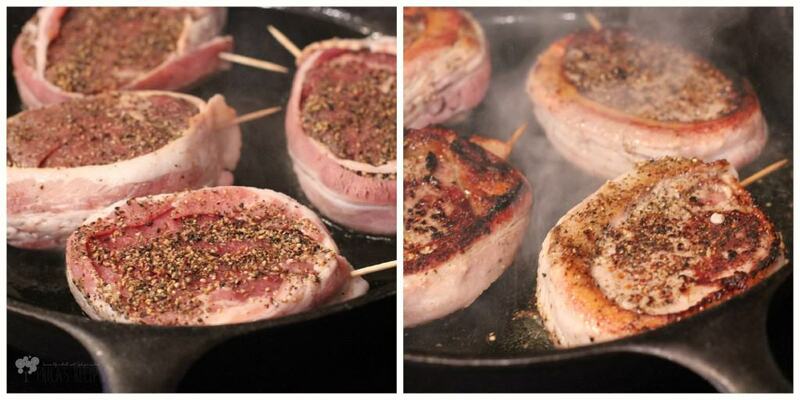 Wrap a slice of bacon around each steak and secure ends with a toothpick. Let the steaks sit 15-20 minutes. Heat a large iron skillet on high heat. While pan is heating, get together the remaining ingredients to have ready. Add the tablespoon olive oil to the hot skillet to coat. Add the steaks and get a good sear on the first side (~2 minutes). Flip the steaks to the other side and put the skillet into the oven. Cook to desired doneness (my 1-1/2-in steaks were medium-rare after 4 minutes in the oven). Remove skillet from the oven and transfer the steaks to a cutting board or dish to rest 5 minutes. 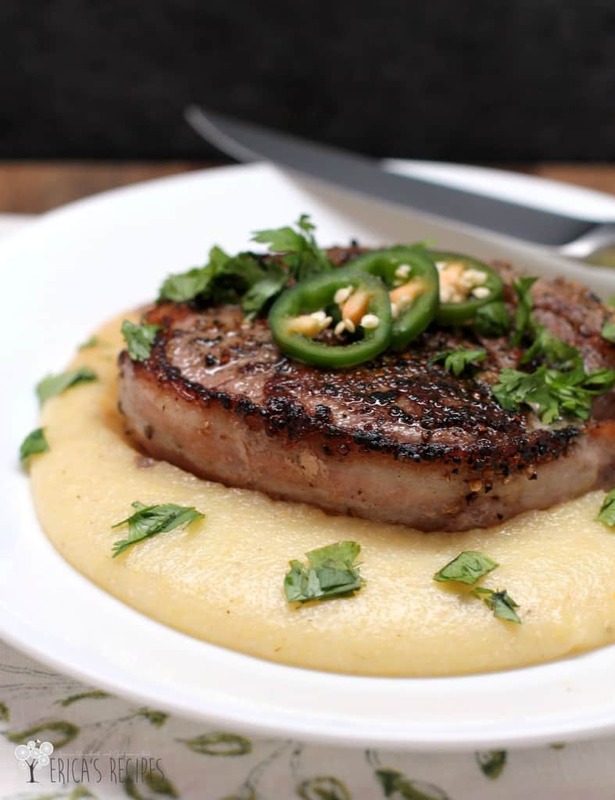 While steaks are resting, make the grits. In a large saucepan, bring the water and milk to a boil. Add the cornmeal in a steady stream whisking constantly to avoid clumps. Reduce heat to medium-high and cook 1 minute to thicken, whisking constantly - be careful against splatter because it hurts. Really hurts. Remove from the heat and add the cheese, 1 t kosher salt, and cumin. To serve, spoon some grits in the center of a dish. Place a steak over. Lay a couple jalapenos slices on top of each steak and sprinkle cilantro over top. Yield: 4 servings. Looks like something that would go over big in our house! Sounds delicious and beautifully presented! Oh geez, I LOVE LOVE LOVE grits. I’ve never had spicy/cheesy grits, so these sound amazing. So glad you could join us at Hump Day Happenings! I’m making this, this coming week-end. I love GRITS. Oh my gosh I just died. Looks so amazing. I love steak, but grits? Yum! I’m making jalapeno polenta for dinner right now! Sometimes the simplest pleasures of life have to get a tiny makeover to make them even better. You certainly captured that concept… pepper jack grits under this magnificent cut of filet with bacon absolutely wonderful and your pictures are so well presented thank you for making my day because I’m gonna make your dish today. Thanks for sharing, this looks so good. My husband commented the other day that the only thing I haven’t made yet that is better than a restaurant is filet (I have never cooked it myself). If I make this for Father’s day, maybe he’ll revise his statement. Gorgeous dish as always! I had to laugh at your grits splatter warning! They DO hurt! I grew up on grits and I love them so much! Your presentation is fantastic as well! Looks so good! Thank you for joining Foodie Friends Friday! Hope to see you next week! I have never eaten grits, but oh my goodness they look delicious in this recipe. The beef sounds amazing too – really lovely with the bacon and peppercorns. 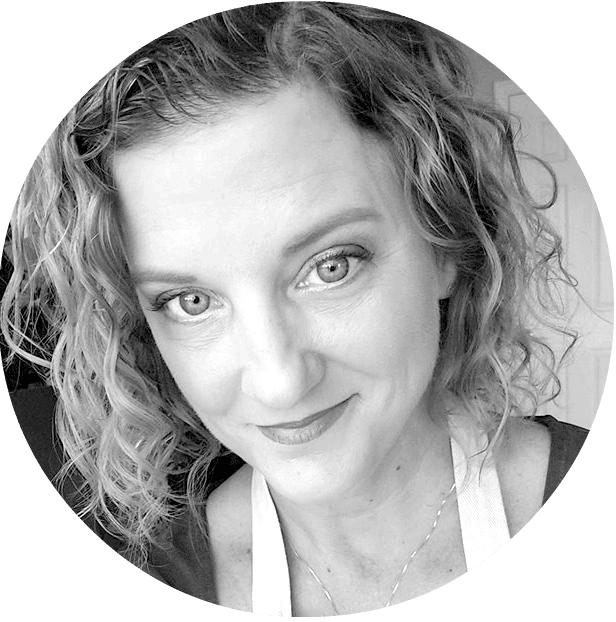 Thank you so much for sharing this post with us at the Hearth and Soul hop. What is the difference between the yellow cornmeal grits and the yellow grits you can buy at whole foods? I sometimes buy the yellow grits when I’m tired of the plain ones you can get at most stores.